Let me tell you the story of these two people who got married on Feb 8. This was an arranged affair and the guy Shivansh ‘sir’ met the girl Varsha only once before this shoot. The excitement of meeting again, their subtle romance and that cute awkwardness made this shoot more special. 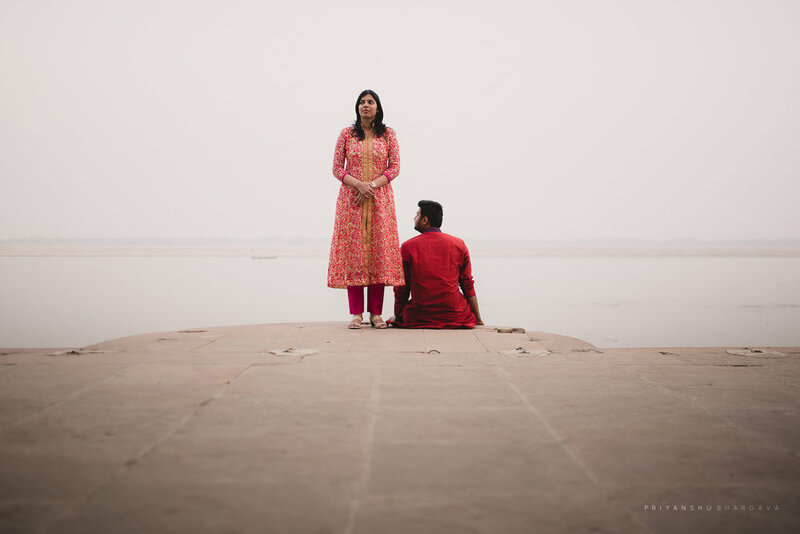 I was on a wedding shoot already when sir called me to reach Varanasi. This shoot was not ‘just another shoot’ for me and I wouldn’t have dared to miss it. Shivansh sir’s beautiful ancestral home lies in outskirts of Banaras, my stay at his home was a detox from hustle and bustle of city. The city has scenic locations in huge numbers and the serene Ghats in morning at the golden hour look more than beautiful. Both of them were shy throughout but somehow that added beauty to their pictures. Varsha was initially very conscious but as time passed she was thoroughly enjoying herself as if no camera was around.This was a different kind of chemistry. My wishes to this lovely couple Shivansh and Varsha. May you both have a sooper amazing married life! Thanks for making me a part of your beautiful journey.